Telephone: +39 41 529 8711. This tourist office next to San Marco–Giardinetti vaporetto stop offers the usual array of maps and pamphlets with information on current exhibitions and events. The Museum Pass (tel: +39 41 4273 0892; www.venice-museum.com) allows entry to 11 civic museums, including the Doge's Palace. The ticket is valid for six months and allows a single admission to each museum. The golden Byzantine St Mark's Basilica was founded in the 9th century as a shrine for the relics of St Mark. Built on a plan of a Greek cross, its Eastern appearance is enhanced by golden mosaics, originally created by craftsmen from the Byzantine court at Ravenna. The interior houses many of Venice's greatest treasures, including the famed Pala d’Oro altarpiece. Telephone: +39 41 270 8311. Mon-Sat 0930-1700, Sun 1400-1630 (Nov-June); Mon-Sat 0945-1700, Sun 1400-1630 (June-Nov). Once home to the elected leader of Venice, the Doge’s Palace is a Venetian landmark of Islamic and Gothic styles that broods over the city. The facade dates from 1365, but its interior is more Renaissance in its flair, originating from the 16th century. The Ducal apartments have exemplary paintings by Titian and Bellini, ancient prison cells and an armoury. Telephone: +39 41 271 5911. Daily 0830-1900 (Apr-Oct); 0830-1730 (Nov-Mar). When a market developed on an adjacent island to Venice in the 10th century, a wooden bridge was built to join the two. It collapsed under the weight of a crowd in 1444 and was replaced in 1591 by a single-stone arched bridge designed by Antonio da Ponte. The bridge has been lined with two rows of shops since the 15th century, which today cater to tourists. One of the most important art galleries in Venice, the Academia has some powerful canvases by Titian, Tintoretto and Veronese. Other highlights include Giorgione's La Tempesta, depicting a naked mother and child sheltering under a stormy sky, and Veronese's bawdy Feast in the House of Levi. Titian’s final painting, Pietà, is here too and is said to include a self-portrait of him facing death. Telephone: +39 41 520 0345. This glorious gothic church, constructed around 1330, is primarily associated with the painter Titian. He is buried here alongside the celebrated sculptor, Antonio Canova. It was here that Titian made his reputation as he crowned his early years by painting the huge altarpiece, The Assumption of the Virgin, for the Franciscan brothers of the Frari in 1518. Telephone: +39 41 272 8611. This 17th-century architectural masterpiece, restored in 2012, once linked Doge's Palace with the Prigioni Nuove (New Prison), which once held Casanova. The bridge takes its name from the sighs let out by convicts as they caught a final glimpse of the outside world. There’s a romantic notion here that lovers will find eternal happiness by kissing under the bridge at sunset. The bell tower of Basilica San Marco, which is located to one side of St Mark’s Square, is the tallest structure in Venice and offers a unique view of this fabulous city. At 318ft-high (97m), visitors prepared to make the lengthy climb might glimpse the distant Dolomites over the rooftops. Telephone: +39 41 270 83 11. Built in the late 1700s, this fabulous Gran Teatro La Fenice was devastated by fire in 1996. 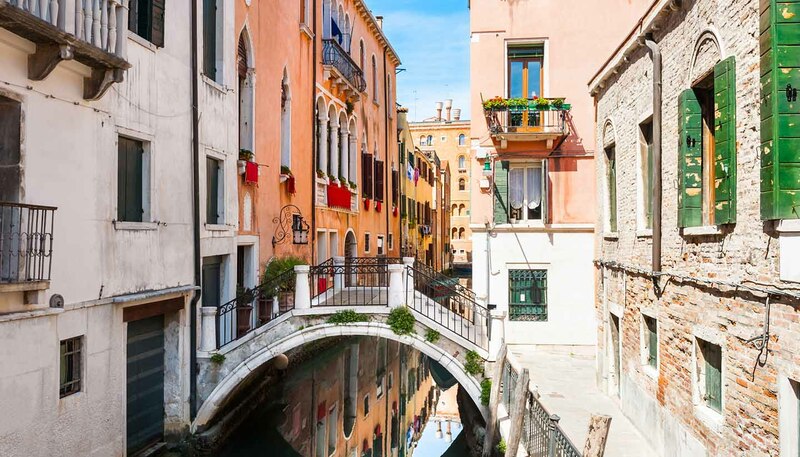 A full restoration has returned this inspiring piece of Venetian architecture to its former glory and it now the theatre plays host to operas, classical concerts and ballet performances throughout the year. Peggy Guggenheim's collection of modern art is probably the most distinguished in Italy. This assembly of artwork spans Cubism, Surrealism, and European and American abstract expressionism. It includes work by a wide variety of artists, including Pollock, Picasso, Kandinsky and Dalí. The sculpture garden is particularly fine and enjoys lovely views over the Grand Canal. Telephone: +39 41 240 5411. This impressive museum displays numerous works, including the vast collection belonging to French businessman Francois Pinault. Controversial artist Jeff Koons' colourful giant Balloon Dog is on display in the main hall while upstairs, visitors will find work by video artist Bill Viola and installations by artist duo Peter Fischili and David Weiss.